In a precedent post we showed the evolution of global media coverage received by cities with more than 100,000 inhabitants in Japan since massive earthquake in March 11, 2011. It referred to news reactions at the very intial stage of Fukushima crisis (news between March 11h and 14th). We also run an analysis concerning media impact by affected Prefectures, and the relationship between media coverage and actual damages suffered. Now we focus our analysis in the cities and localities actually affected by the disaster, by the damages reported in personnel and properties directly provoked by the earthquake or the tsunami. Sample also include cities affected by the ongoing nuclear crisis. In the next figure we show top 20 cities and localities that have received highest levels in terms of international media attention. Data refers to news published till March 27. We have excluded from this table the three cities that have focused media attention during these first three weeks: Fukushima, Tokyo and Sendai. If included, all other cities become almost irrelevant in terms of media impact. Also, as we have seen in a precedent post, in many cases news refer to devastation mentioning regions instead of small localities. Regions in Japan are organized in Prefectures. As we saw, main references are Fukushima Prefecture, followed bt Miyagi and Iwate. Beside the three city outliers, the main reference in the media according to our results is Ishinomaki, with 7.0 points of media value. It means that this locality has received a number of news equivalent to 7 times more than the average of top 100 cities affected by the disaster (excluding big three). Second city by media impact is Kesennuma, with 6.4 points. These two cities have reported 2,700 inhabitants killed by the tsunami, and another 4,160 citizens are accounted missing. The following table shows the results concerning the 50 cities most affected by the disaster in terms of media value, and factual numbers about deaths and property damages. 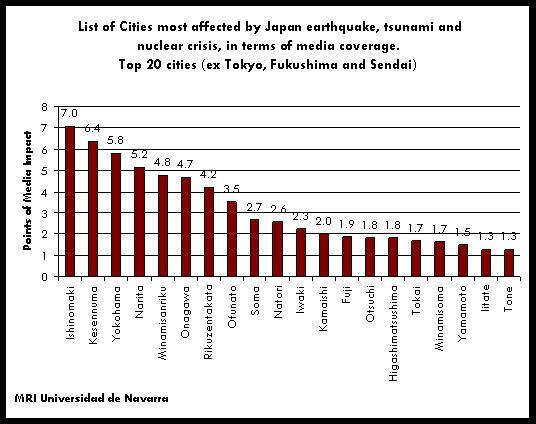 The list includes top three cities by media coverage: Tokyo, Fukushima and Sendai. Top ranked city is Fukushima, with 235 points of mdia impact. This means that is has received an amount of news 235 times higher than the average of top 100 localities most affected by the earthquake and tsunami (excluding top 3 cities). Second city most present in the news is Tokyo, with 217 points fo media impact. These two cities concentrate all media attention, as Sendai, which comes third, takes a media impact value of 37 points. We can have a reference of how massive is media attention to Fukushima when we realise that media coverage given to Ishinimaki, fourth ranked city, was just 7.0 points. The sample under analysis concern 463 cities and towns where actual personnel or property damages have been officially reported. The source used is CATDAT and CEDIM (earthquake-report.com). Data is updated by James Daniell. This organization relies in official accounting provided by Police Department. This source was used for the data we presented in the post about Prefectures media impact. Fukushima reputation will we always linked to the nuclear disaster, even if Fukushima city is situated more than 50 kilometers away from the crippled nuclear site, Daiichi. As it is also kwnown as Fukushima I (against Fukushima II complex, situated some kilometers Noth, in Naraha town), media has labeled the site as Fukushima nuclear plant. The city and the Prefecture of Fukushima will pay the price in terms of negative reputation, even if radioactive contamination does not finally reach all the region or the city. Present ratio Fukushima/Sendai is also telling about media coverage trend. In our previous post with news between March 11 and March 14, Sendai appeared the media reference just in the aftermath, and in the last measurements Fukushima became yet the media reference, but with a similar media impact value. Now, all tsunami related news are almost disappearing in comparison with the non closed nuclear crisis. Looking to the ranking of cities, we can appreciate that it exists a close connection between media impact and number of people death and missing. There also some cities in the list that have suffered a limited number of personnel casualties because they were not directly affected by the tsunami as not being coastal cities, but have been severely affected by the earthquake in terms of proprerty and infrastructure destruction. This is probably the case with Koriyama (ranked 23), Mito (36) or Haga (38). Finally, we find some other locations departing from the common trend, as they appear in the top 50 cities by media coverage received in relation with the disaster, but the figures show that they have not suffered directly relevant casualties. These cases require a specific news content analysis. Once the analysis is performed, we come to the conclusion that their presence in the list is justified, but for other grounds. Last column in the table provides some explanation of their presence in the list. There are some different groups of locations. There is a group of cities receiving media attention simply because they are the main urban agglomerations in the affected area. This is the case for Yokohama (position 6), Fuji (16) or Kawasaki (28). There is a second group of cities present because they host sites of special infrastructures: the international airport (Narita, position 7), a US Air Force base (Misawa, 24). Ichihara appears in the list (position 42) because the oil refinery suffered damages with spectacular burning images. The third group of locations are all related with the nuclear crisis, and are taking increasing media prevalence in comparison with tsunami devastation related locations. Inside this group we find the cities in the relative nearby of the Daiichi damaged nuclear site. They are in the evacuation zone or not: Soma (position 12), Iilate (22), Ono (40), Kawamata and Date. 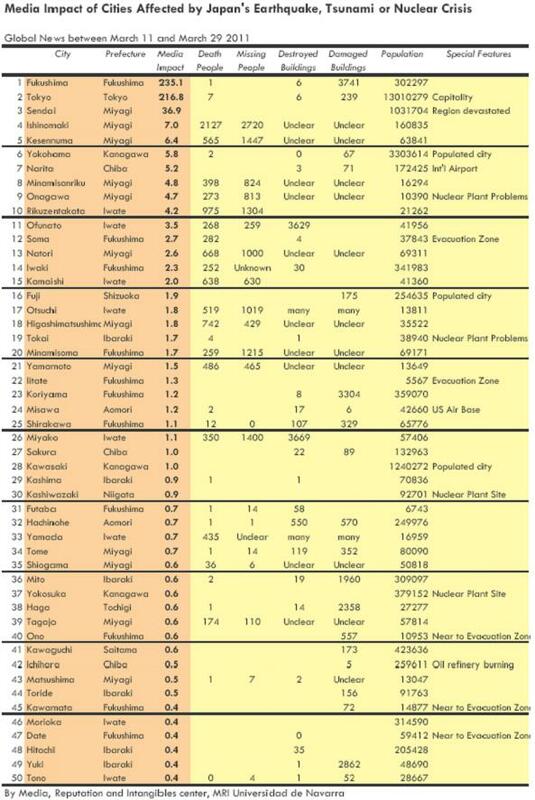 Finally, there are some other locations in the list because they host other nuclear sites. Onagawa (position 9) and Tokai (19) faced some problems in the aftermath of the earthquake, but they are apparently under control. The other sites have not been damaged, but they appear nevertheless among top locations by media coverage: Kashiwasaki (30) and Yokosuka (37). Japan IX. Fukushima Nuclear Crisis Media Views in United States, United Kindgom, Australia and India. Japan VIII. Wikileaks on Fukushima and the Japan Nuclear Crisis. Measurement of the Initial Media Storyline. thanks for your informant it good but we need more for kids assignments from one of your reader khumo. Dear someone. I would appreciate a lot if you can develop a little bit your thoughts. Your comment could suggest that you find funny the effects of the tsunami in terms of people killed, which is an improper comment in a publicatuion with an academic profile. Thank you.